I couldn’t resist any longer, I just had to see what was in the ground under the jerusalem artichoke plants! 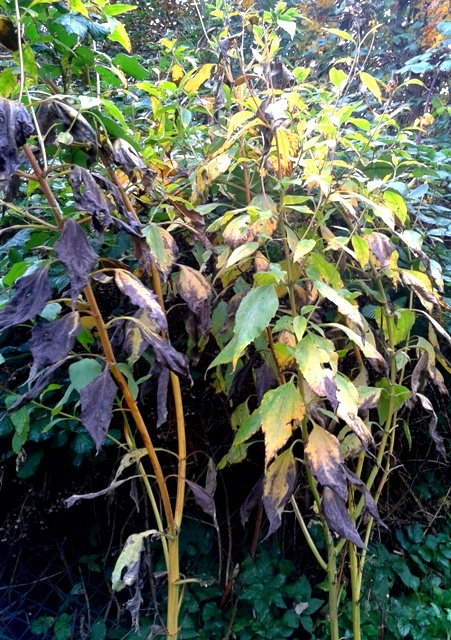 Those jerusalem artichokes (Helianthus tuberosus) that have been guarding the garden against a recurrent blackberry invasion. They have grown to over two meters, flowered with their beautiful miniature sunflowers, held on to the soil on the slope and survived antler rubbing from the deer, all obvious to the eye, but how did they look underground? Turns out they looked goood…. 🙂 Smooth, lots of ’em, and the biggest were almost the length of my palm. Tasty when diced and baked together with other root vegetables or in one of my favorite salads: grated jerusalem artichokes, carrots and apples. All in season locally right now. 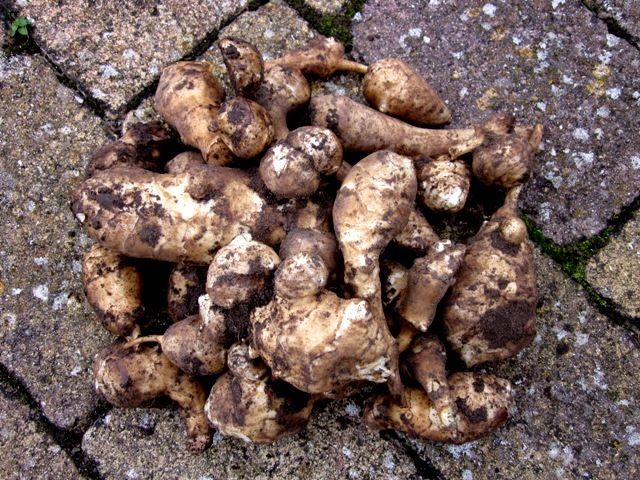 And another really nice thing about j. a. : they are really hard to get rid of, they keep coming back year after year, from overlooked tubers in the ground. Oh, and they keep well in the soil through the winter, they can just be dug up when needed, as long as the ground isn’t frozen. It’s a win/win/win/win/win… many times! The plants look pretty scrawny now that it’s autumn, but they have performed many functions that I know of, and probably even more that I don’t know of. Wait! How are they managing to hold back the blackberries? How do they do in very moist (ie. muddy) soil? I planted them pretty close, about 40 cm apart, and it seems that they have closed off the light, so the blackberries mostly try to get over the j.a. instead of through. Twice during the summer I have cut back the few blackberry brambles that grew over the top, about one every other meter – manageable in under half an hour in my relatively small garden. How muddy is muddy? Not many plants can grow without air in the soil… But then again the j.a. is very tolerant of soil conditions. Like most tubers, it prefers a lighter soil with space and air to develop, but I have successfully grown it in clay soil. In Denmark, white mold, Sclerotinia sclerotinium, is pretty much the only disease it is susceptible to, and that rarely, but a lot of moisture could potentially promote it.